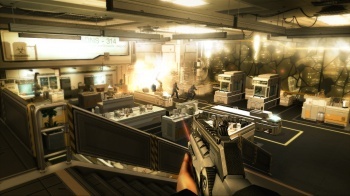 GameStop is no longer selling the regular PC version of Deus Ex: Human Revolution. It came to light yesterday that GameStop was opening copies of the PC version of Deus Ex: Human Revolution and removing a coupon that offered owners a free copy of the game from cloud gaming company OnLive. GameStop made no bones about it, saying that Square Enix put the coupons in so it pulled them out, but that forthrightness did nothing to soothe the savage gamers. So now GameStop has gone to Plan B: it's not going to sell the game at all until Square Enix comes across with a coupon-free version. A memo was sent out to every store in the company, telling employees to pull all regular edition copies of DX:HR for the PC in advance of a recall. "As GameStop is developing a streaming service in our Spawn Labs Cloud Computing Division, the coupon that was included is for a competing service," the memo said. "We are returning all copies of the PC regular edition to the vendor in agreement with Square Enix." Square Enix, meanwhile, released a statement acknowledging its role in the debacle. "As part of Deus Ex: Human Revolution's boxed offering on PC, Square Enix included a third party coupon. GameStop was not made aware of this inclusion and Square Enix respects the right of GameStop to have final say over the contents of products it sells and to adjust them where they see fit in accordance with their policies," the statement said. "Square Enix invites gamers who want to purchase the PC version of Deus Ex: Human Revolution without additional coupons to buy the game at any one of over 4000 GameStop stores in North America or purchase a digital download copy online from www.gamestop.com." It was beyond not smart to bust open copies of the game and yoink materials from the box, regardless of the circumstances, but at least the company appears to have recognized the immensity of its faux pas and is now doing its best to clean up the mess without stepping on any more dicks. According to the memo sent to GameStop stores, existing preorders can still be filled with the existing stock and any aggrieved customer who wants to return the game can do so with a receipt. Source: The Video Game Writers, thanks to RedEyesBlackGamer for the tip.